Whether you are planning for an investment, acquisition, strategic partnership or a merger, VMR & Company (Chartered Accountants) is always present to help you in such matters. Ours is a service provider company, involved in providing due diligence services to the businesses in and around Delhi, India. 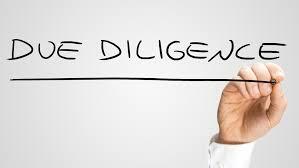 Ours team of due diligence analysts works in coordination with clients’ business requirements and provide valuable reports. Our services are rendered in accordance with the governing rules and regulations. Contact us anytime for further discussion.